Dislike: seems to be cut a little short for our king size bed with a deep mattress (no box spring). Like: well-made, quilt washes well and doesn't fade. Love the shams. I would definitely recommend this product. 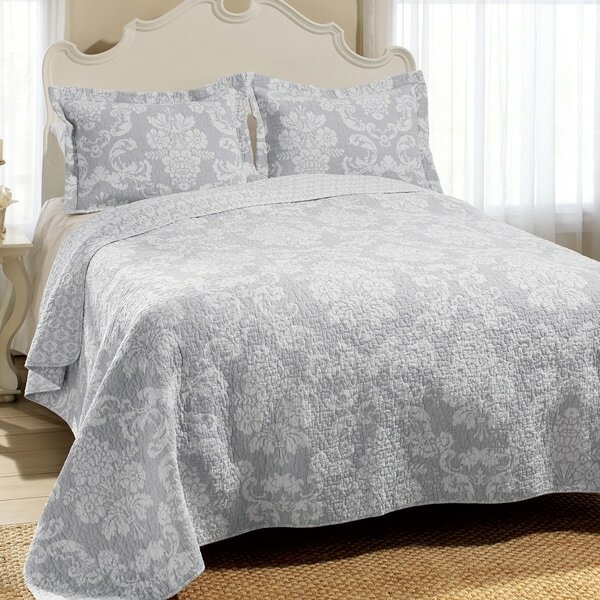 A classic design paired with exceptional comfort, this three-piece quilt set from Laura Ashley includes a floral-patterned quilt and two pillow shams (only one sham in twin set). Featuring a neutral grey color palette and an intricate medallion pattern, this cotton quilt set blends subtlety for a timeless appeal. The set is made from machine washable materials for added convenience. Layer with our Laura Ashley sheets and accessories to create your own unique look. This set is beautifully made. The size is substantial. I have purchased quilts from local dept. stores, and they were not sized for a standard king bed. This one is long and wide enough to meet the top of the dust ruffle, right where it should be. The shams are generously sized and well-made. The quilt is heavy enough for the Midwest winter nights. Pattern is pretty. All-in-all, a great set and priced right. I was looking for a summer quilt in gray. Laura Ashley is a brand name that I have found to be of good quality. Positives: Attractive pattern, cotton, finished edges, comes with shams, square dimensions which is a plus for making the bed. Negatives: A little on the thin side, smallish (I bought a full-queen for a full bed. 100% pleased with this purchase for the following reasons: high quality quilt with attention to detail in design and stitching. Lightweight but warm. Love the colors and the reverse pattern! Comes with matching shams at no additional cost! Shipped fast and completes my vintage grey / classic white bedroom look. 5 stars!!! The quilt arrived with a rip along the seam. The customer service response was great. I sent a message through my overstock account and received a shipping label within an hour. I could have received a replacement, but the quality was below average. The quilt pattern is pretty, but the material is very thin and the binding on the seam was so small that it will eventually come apart from regular use and washing. I searched a long time to find this Quilt set. I love it! Washes easily and wears great! Did I mention that I LOVE it??? This quilt is so beautiful, the weight is just right, it fits well (I bought the queen size), shams are nice - good quality and fit over standard pillows. Price was good too! I love this quilt. It is actually wide enough to cover the sides of my mattress on my queen size bed. It is super soft as well as beautiful . Great price and quality. I bought this quilt in Queen size. I had purchased a new mattress, and it was so tall that my old quilt did not cover the sides well. This one fits perfect. I love the gray color. It goes with almost anything. Very stylish. I've been looking for a grey and white quilt for some time, and I love this! Beautiful quilt and easy to clean. Zero overhang on the sides on a king size bed. Very disappointed. I love the grey color. The weight of quilt is perfect for me. I am a women going through menopause. I love the feel and it's great quality. Love this quilt! It is soft and light, just right for Southern weather. The color is neutral, but the white print is lovely and gives it that special look! We love this quilt. It washes up nicely and is the perfect weight for fall/spring/summer. We’ve had it for several years now and we keep pulling it out to switch up with our duvet. This is for my warm weather decorating for my master bed room. I love the quality of Laura Ashley products. The size of the quilt provides a generous drop that works well on my king size bed with a dust ruffle.Can't wait for spring to redecorate the room. Beautiful Gray quilt, updated the room perfectly. Nice quality and subtle hues. I have bought this for my daughters bedroom as well as a gift and it gets so many compliments. Very nice price and fast shipping too! This is such a pretty quilt and the versatility of it being reversible makes it so much more functional. Can easily change up the room with just some accessories like pillows and throws. Its a nice weight. Have not washed it yet so hoping everything works well in that area. Love this bedding! It is light weight, cotton and keeps me warm without being too heavy. The pattern is lovely and the colors are crisp and clean. This makes the room very comforting. I still have a Laura Ashley quilt I purchased 20 years ago and it is in great condition so I know this is good quality. Buy and enjoy! "I am trying to select this for a full/queen size bed. But the drop down choice is: Laura Ashley Venetia Grey Reversible Cotton 3-piece Quilt Set - 2 Piece - Twin/Full - Queen/Full HELP"
"Is there anyway to get the quilt in a King, but the pillow shams in a queen ?" These sets cannot be customized. "I have a king bed with a bed skirt. 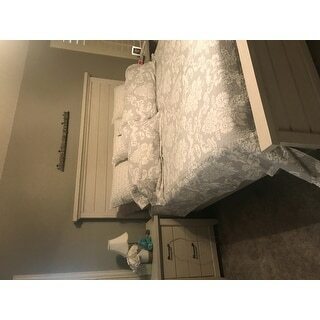 I would like to keep the bed skirt so if I order a queen quilt will it look okay with the bed skirt?" Im sorry i really couldnt say as i bought the quilt for a plateform bed.. although i have not yet used it.. it is quite pretty & very light weight, waiting for summer..
"Are the pillow shams reversible like the quilt?" No, but the back of the sham has the alternate pattern. However there's an opening on the back where you insert the pillow so it's apparent that it's the back of the sham. "What are the measurements of the queen and the king size quilts?" Hello Di, the queen size quilt is approximately 90 inches wide x 90 inches long. The king size quilt is approximately 104 inches wide x 96 inches long. Thanks for shopping with us! "can I purchase additional shams"
Hello chanie, we do apologize, we do not currently offer the shams sold separately for this set. Thank you for shopping with us. "Will this hang over nicely with a deep mattress? I have a 13 inch high mattress." Hello Katie, in my opinion, this will hang well over a deep sized mattress. Thank you for shopping with us.